Submitted by Alexander Briones on Jan. 23, 2018. Originally published on June 14, 2016 and updated on January 23, 2018. This guide is primarily focused on mixing consoles used for live sound, although some of the passive mixers we recommend also work quite well in a recording context. The audio mixer is literally the heart of every live performance, where all sounds converge to be mixed and processed - and finally pumped out through the speakers. It is where major connections are routed to, and where important parameters are set including volume, EQ adjustments, balancing and much more. 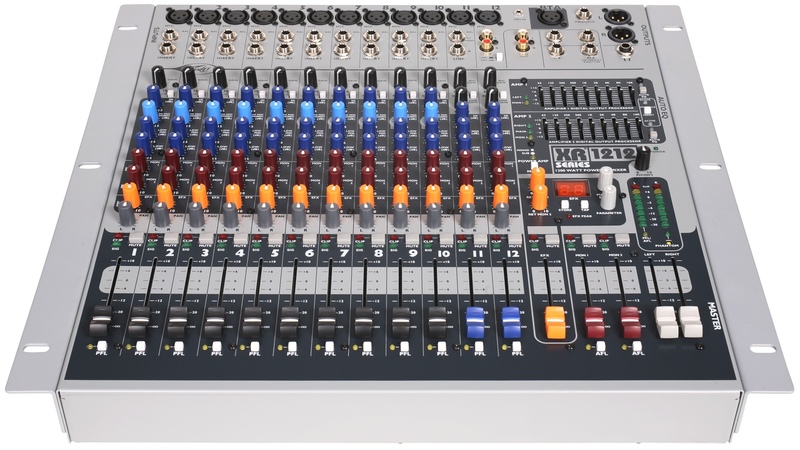 As such, it is a critical piece of gear that require careful consideration, which is why we have updated this guide to showcase what the market considers to be the current highest rated mixing consoles. Behringer endeared themselves to many by making quality workhorse music equipment more accessible and affordable. Case in point is the Europower PMP4000, a popular powered mixer with 16 channels and 2 x 300W rated power amplifier section which features their Class D (low temperature operation) amp design. Much like most of their products, this one comes packed with a hefty amount of bells and whistles, including a 7-band Graphic EQ and multiple effects. 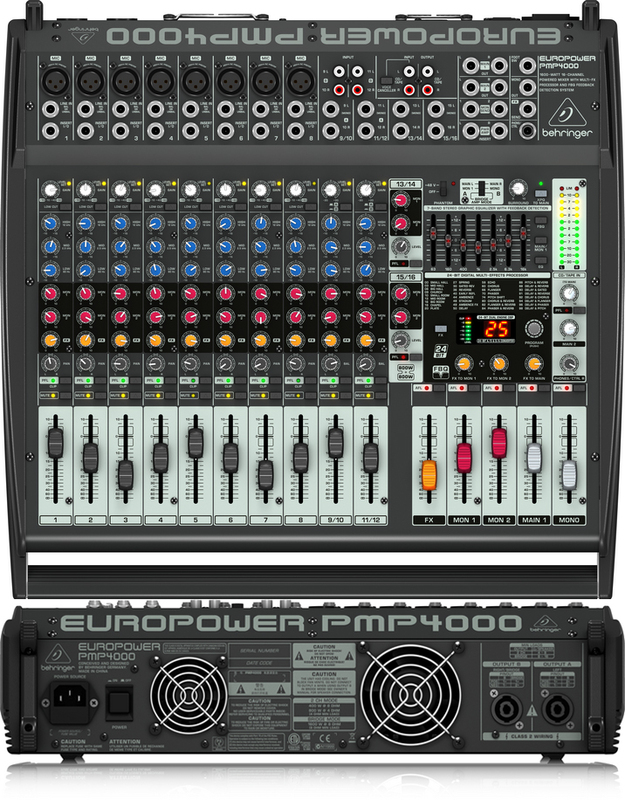 Many who upgraded from older mixers were impressed with the Europower PMP4000, stating that it really improved and simplified much of the soundman's work. Clarity and overall sound quality received a lot of commendations, even those that rated it poorly for other reasons cannot help but praise the sound. From karaoke to band gigs, many have put this mixer to good use without many problems. The most notable complaint about this mixer is that the marketing material, and some online stores, specify the peak power rating of 800W per channel. This led to some users finding the actual program power to be underwhelming, specifically, those that wanted to use the PMP4000 on medium and bigger sized venues. The Behringer Eurpower PMP4000 is highly recommended if you need an all-in-one mixer + amplifier solution for a small venues. This 14-Channel audio powered mixer is meant to be an all-in-one answer to the typical needs of small venue sound reinforcement. It has enough input options and controls for most musical applications, while saving on space and weight. Finally, since it is from Yamaha, you get their brand of reliability for longterm worry-free use. Reliability and sound quality were commended multiple times, prompting many users to not only rate the Yamaha EMX5014C highly, but to also recommend it to others. Ease of use and setup were also brought up often, with special emphasis on how easy to ease to get great sounds with the unit. There were a few users who wanted a bit more EQ versatility from the unit, specifically on tweaking the monitor output. Other than that, most have good words to say, even those that deducted some points because of EQ features that they felt were lacking. 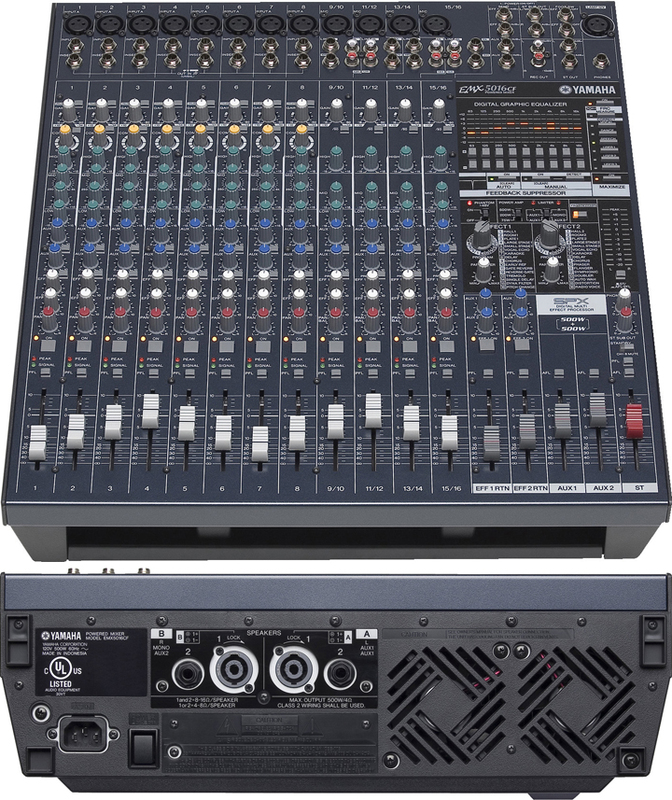 If you're looking for a budget-friendly and reliable 14-channel powered mixer, then check out the Yamaha EMX5014C. It's impressive how Yamaha is able to maintain their reputation for quality across their expansive line of products, from instruments to stage gear. 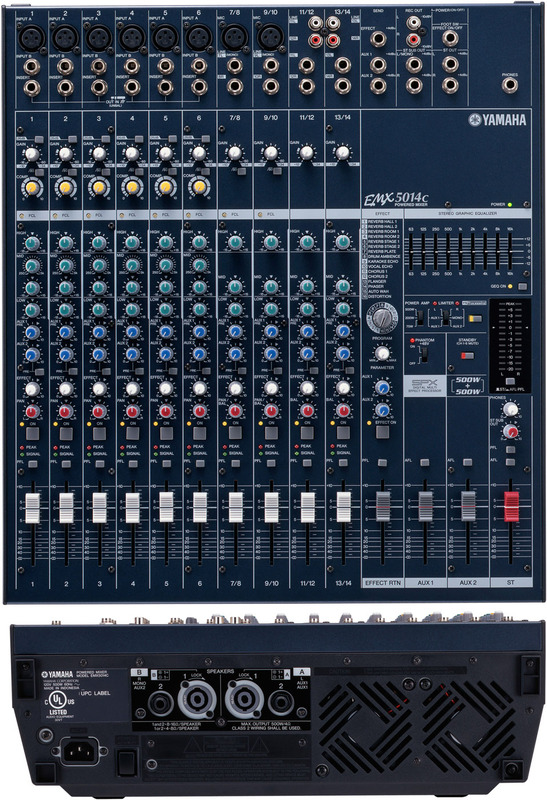 Case in point is the Yamaha EMX5016CF powered mixer, with its 16 inputs, expanded tone shaping options and built-in 500 watts per channel power amplifier. It comes with a wide variety of features including a 9-band graphic main EQ, an onboard sonic maximizer effect and a nifty feedback suppressor. The general consensus is that this powered mixer is exceptionally good - providing clear sounds that are supported by complementary features that do not complicate control. An expert reviewer mentioned the mixer's impressive room calibration and correction system, which can be done using a mic plugged in channel 1, quite nifty especially for those who are new to handling mixers. Other positive mentions include the 9-band graphic EQ, the one knob compressor and the feedback suppressor, all of which have helped many users in getting the sound right and keeping it right. There aren't many complaints, aside from some nitpicking. There was an experienced user who didn't like the idea of a built-in compressor, and there was another who wants the flexibility offered by a separate power amplifier. To summarize the overall sentiments of reviewers, I'll quote one user: "Excellent little powered mixer. Easy to setup and use". 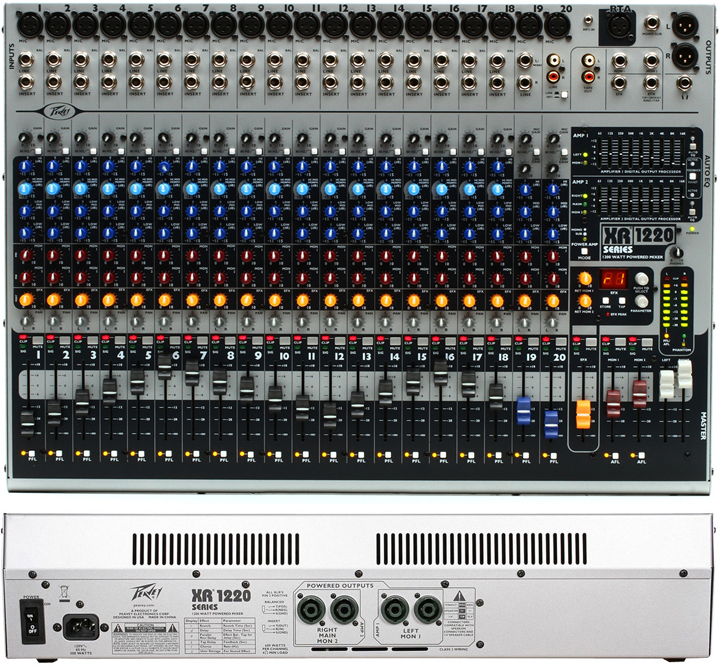 The Peavey XR1212 is a compact 12-channel powered mixer ideal for portable use and for small venue setups. It comes with familiar mixing console format with dedicated input and EQ options per channel, as well as main EQ controls. What's more interesting is how Peavey combined the mixer with a built-in dual 600W Class D amplifiers, while keeping the overall weight light. Inputs: 12 x XLR, 12 x 1/4", 2 x RCA, 1 x 1/8"
True to Peavey's reputation for longevity, the XR 1212's compact and solid build gets a lot of thumbs up. But it's not just about being solid, because many are just as impressed with its sound quality and ease of use. Feedback control is also well received, with many reporting that switching to this mixer made a big difference. Aside from a few shipping related complaints, there aren't any other noteworthy issues with the XR 1212. If you're looking for a reliable and compact 12-Channel powered mixer, the Peavey XR 1212 is highly recommended. There's no denying that Peavey has won the confidence of many with the quality of the music gear they manufacture, so it's not surprising to find their products doing well in the market - including the XR1220 Powered Mixer. This lightweight mixer packs quite a lot of bang per pound, weighing in at just 25 lbs., it sports 20 channels and a host of complementary features that make it a viable workhorse mixer and poweramp unit for small to medium sized venues. Outputs: 2 x XLR, 1 x 1/4" (Mono), 4 x speakON (Mon 1, 2), 2 x RCA (Tape), 1 x 1/4" headphones out. From small acoustic groups to full-on bands with miked drums, many reviewers found the XR1220 more than satisfactory. Users have reported using it for clubs and churches, and some even use it for their studios, which is a testimony to its overall sound quality and control. Also note worthy is how many customer reviews praised the mixer's intuitiveness, stating that it is very easy to setup and configure, and that they had it running in no time. The ratings for this mixer would've been higher if not for some negative scores due to shipping issues, there are also some who reported finding defects out of the box. Thankfully these are rare, and can be resolved via warranty. There were also those who found the power amp section lacking for their bigger venues. If you're looking for a reliable 20 channel powered mixer that you can carry around for mobile musical productions, then this one is just for you. These are mixers that work with external amplifiers (including powered speakers), covering both the latest digital consoles and analog console mixers. Incidentally, digital mixers are mostly rated higher than analog mixers. The Yamaha MG12XU is a compact mixer that combines traditional analog interface with modern built-in digital effects. At the core of this mixer is Yamaha's D-PRE mic preamps, which are known for good sound quality. This is complemented by a wide array of effects, including essentials like reverb and delay, as well as other effects like phaser, chorus, flanger, tremolo, auto-wah, distortion, pitch effects and more. In addition, it features conventional EQ with HPF (High Pass Filter), one-knob compression effect, switchable phantom power and a pad switch. From its good sound quality, to its versatility via built-in effects, the Yamaha MG12XU continues to haul positive reviews and high ratings. It's intuitive analog interface impressed many first time users, while experienced sound technicians were happy with the control options and digital effects that it carries. It's been implemented well in various situations, including jazz ensembles, small venues, rock bands and more. There are a few who are not too happy with the lack of "insert" ports, especially those who use third party hardware to apply effects. There were also some who cautioned that the exterior of the MG12XU is not as reliable as the older versions. All in all, the Yamaha MG12XU is a good 12-channel mixer for those who are looking for something compact, portable and versatile. QSC is better known for their line of loud speakers, but they also excel in other PA related products, including mixers. The TouchMix-16 exemplifies how they excel in the mixer market, specifically designed for portability and ease of use without compromising sound quality, connectivity, and control depth. At just 5.9 lbs, this mixer is many times lighter than others with the same amount of channels, and it offers modern features that include a touch screen interface for controlling the faders. Onboard Effects include Chorus, Reverb, Pitch Correction, Delay and Echo. 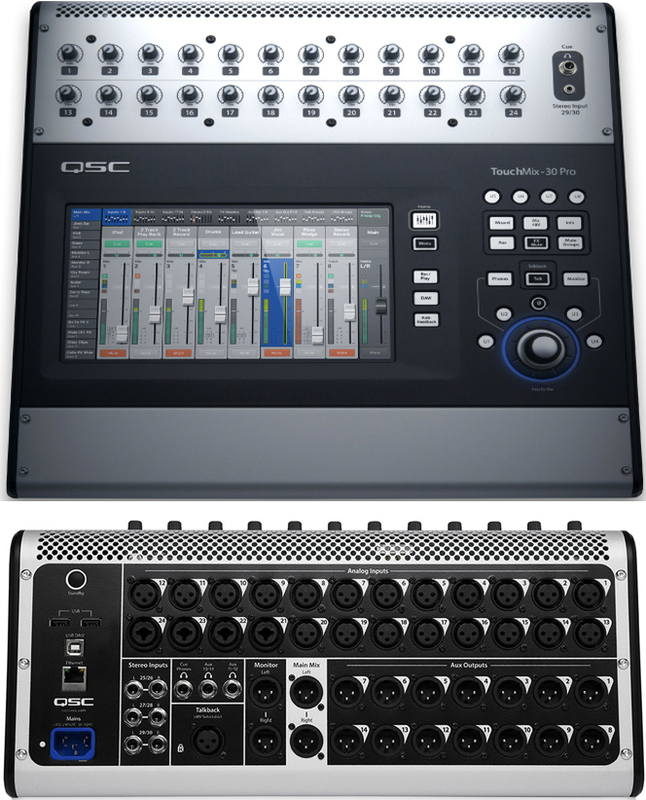 With up to 20 channels, the QSC TouchMix-16 offers impressive value and features per pound, something that many reviewers specifically mentioned. And it's not just limited to connectivity and features, because the sound quality itself got a lot of thumbs up from experts and other users. 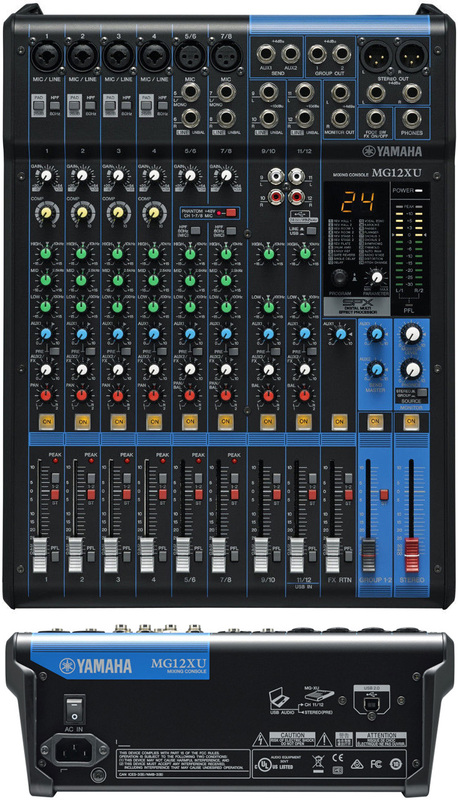 Most who have used the unit say this is easily the best compact 20-channel mixer in the market today. There aren't a lot of specific complaints other than the expected shipping and factory defect issues. The QSC TouchMix-16 is the best choice if you're looking for a portable mixer that does not skimp on quality and depth. 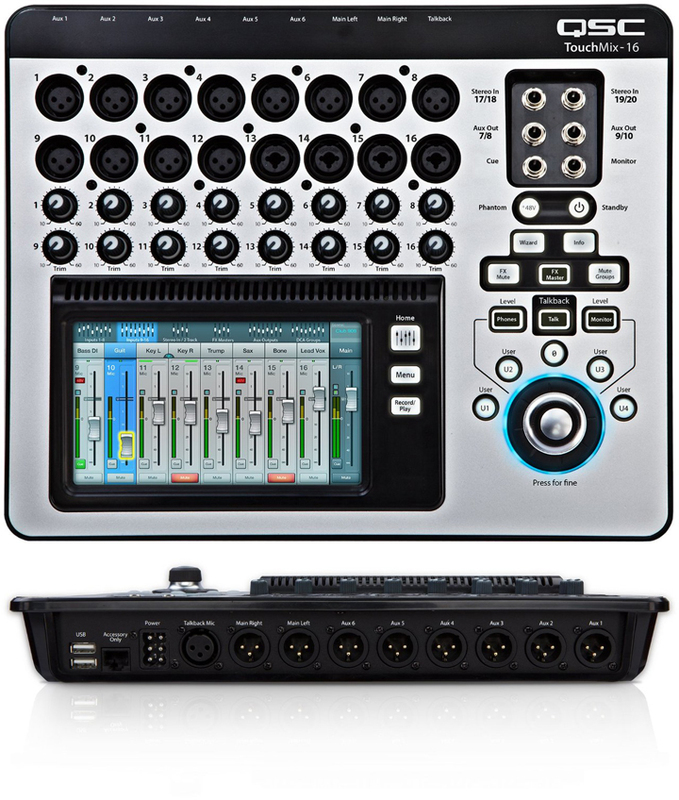 The Behringer X32 Compact is a versatile and portable digital mixer solution for live performance and recording. As expected from Behringer, this mixer comes with the latest technology that they can offer, including motorized faders, 16 MIDAS designed preamps, 32 Channel operation, multiple input/output options, built-in Effects/EQ and many more. But what makes the X32 Compact even more special is how it packs all these features inside a light and portable form factor that's reasonably priced. Market response is overwhelmingly positive, with many exclaiming how the Behringer X32 Compact exceeded their expectations. It has enough channels and input/output options for most venues, including places of worship, auditoriums and other medium to large size venues. While other users report that the unit's digital features allow for quicker and more efficient setups. Mike Crofts of Sound on Sound had this to say: "... I'd say that what the X32 Compact does, it does well, and at a price point that is interesting to say the least." There are a few users who wished for more input/output options, but they are stretching their luck a bit too much given that this mixer is meant to be Compact - as the label clearly suggests. 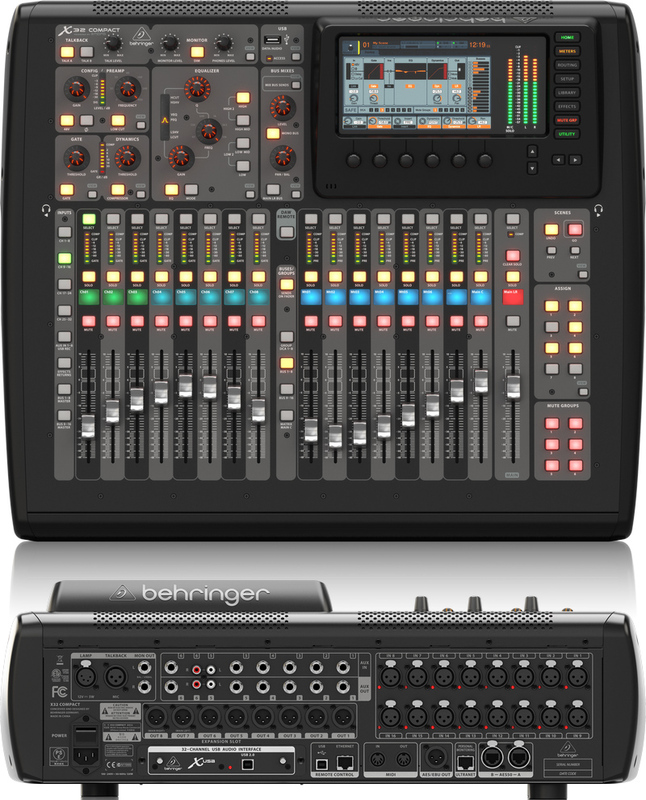 The Behringer X32 Compact is easily the best value compact digital mixer on the market. With its standout 10" multi-touch screen and extensive input/output options, the QSC TouchMix-30's can get a lot of good things done for its size. Like the TouchMix-16, it is easy to operate with simple navigation controls, so don't let the digital label put you off. With its 24 mic preamps, built-in effects (including pitch correction), and intuitive controls, this mixer is more than capable of handling the needs of most music related venues, and do so with the convenience of loading up previous settings. Wireless control via iOS/Android devices adds even more convenience to its already impressive feature set. Inputs: 20 x XLR, 4 x XLR-1/4" Combo, 6 x 1/4" TRS (stereo), 1 x 1/8"
Up to 6 Simultaneous Onboard Effects including Reverb, Delay, Pitch Shift, Echo, Chorus and more. The saying "big things come in small packages" applies nicely to the QSC TouchMix-30, as attested to by the many positive reviews that it continues to garner. From its input/output flexibility, to its versatile controls - users are simply amazed at how this mixer performs. There many reports of it working well in live performances and home recording settings, a further testament to its quality and versatility. There are a few who are not happy with the interface, while others were looking for a bit more in the way of inputs options. If you're looking for a versatile 32-channel mixer that can work well in both studio and live performance settings, then check out the QSC TouchMix-30. Allen & Heath made a name for itself by building a special mixing console for Pink Floyd back in the early '70s. They have since expanded into a big name manufacturer who also pioneered small mixers. 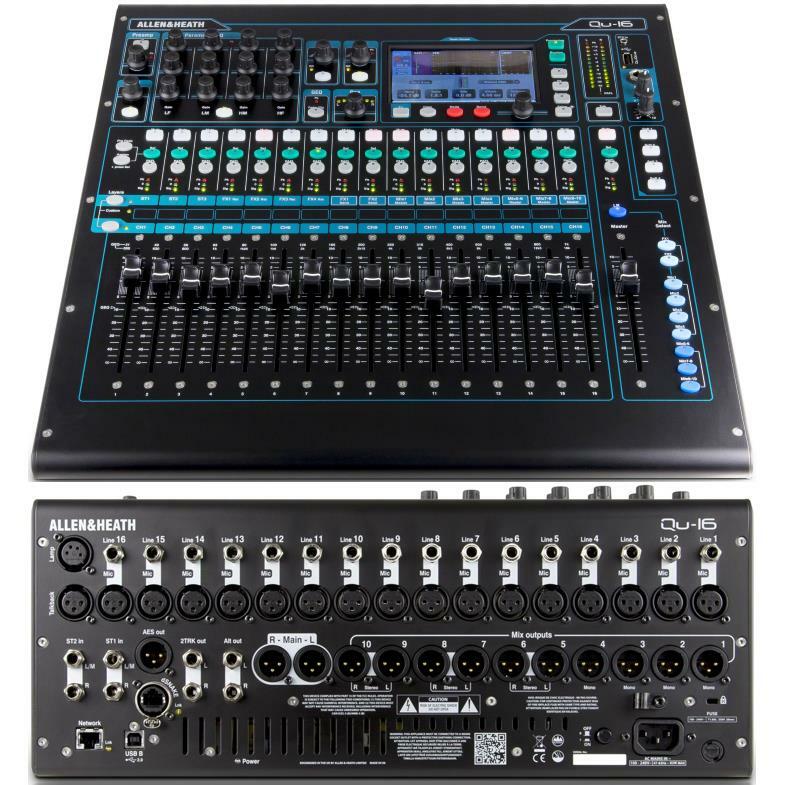 So it's not surprising to see them included in this list with the Qu-16, a 16 channel mixer with built-in effects and a nifty top-rack mountable design for easy storage and transport. For a digital mixer, the Qu-16 got many positive mentions of its analog components, specifically its great sounding mic preamps. Almost every reviewer agrees that it sounds great for a wide variety of music applications, and many also commended its practical extra features including virtual soundcheck, EQ, effects and compression. Many also find the recording feature to be of great quality, and has been using the unit for live recording with great results. There are users who reported that the learning curve for this digital mixer is a bit deep, but the rewards are well worth the extra time spent reading the manual and trying out different settings. If you're looking for a great sounding mixing console desk that's rack mountable, or if you're looking for more control over your PA system via digital means, then check this one out. The more input options available, the easier it is to accommodate the different instruments and tools of performers. If you're using mics that require Phantom Power, you'll want as many phantom power equipped channels to match the number of mics. The same rule applies to channels, more channels will let you accommodate more sound sources simultaneously. On the flip side, the inputs and channels require more space and components, which translate to added bulk, weight and cost. So it is recommended to assess your needs prior to buying a mixer. 16 Channels is good enough for the usual band setup. Powered mixers come with built-in amplifiers, so they perform two tasks simultaneously and allow for an even more streamlined and centralized operation. With these, you don't need a separate amplifier, simplifying setup and reducing potential clutter. Since it houses the amplifier, all the amp controls are also accessible within the unit. Passive mixers on the other hand require a separate amplifier to work, and along with it extra cables. While it does complicate setup, it makes troubleshooting easier since the two units are separated, also reliability is better since there are fewer components within the mixer. EQ settings and effects allow you to make quick fixes and adjustments to the resulting sound, which is important especially in a live performance situation. Note that having too many of these options may be detrimental, in that you may waste too much time setting up. The main compatibility considerations include how many phantom powered mics you'll be using, the number and types of inputs, built-in effects, and the ability to directly connect to a computer for live recording if that's what you need. For this update, we looked at powered and passive audio mixers that consistently rank well, so we ended up with a short-list of over 30 mixers. We then collated all related ratings, reviews and forum discussions, and fed all 4,900+ of them into the Gearank algorithm. This process gave us the scores that helped us narrow down the list to the current best among them. The result is the list that you see above, divided into Powered and Passive categories. For more information about our processes see How Gearank Works. Submitted by JB (not verified) on Oct. 24, 2017. Back when we completed the research for this guide, Soundcraft mixers didn't make it onto our short-list, however a quick look at the current data suggests they will at least be on that list when we next update this guide. Submitted by lulu (not verified) on Dec. 14, 2017. Submitted by Jack (not verified) on Dec. 17, 2017. Yamaha will be your best choice for any high end application in professional audio equipment . Submitted by Jason Horton on Jan. 23, 2018. Submitted by Vinh Mai (not verified) on Jun. 4, 2018. I read it some where that we should not use the power mixer to set up with power speaker due to conflict some thing between them and make the power speaker easy blow up after while use them. Is that true? if not then what is best mix between power speaker and mixer? Powered means that they have an amplifier built-in, so if you send an amplified signal from a powered mixer to a powered speaker which is expecting only a line level signal, then yes you will damage the powered speaker. Technically, you could use a line level output from a powered mixer to safely drive a powered speaker, but then you wouldn't be using the amplifier in the mixer so you'd be paying for an amp you're not using and you'd have extra weight to lug around. For these reasons it's best to use powered mixers with passive speakers (unpowered) and use unpowered mixers with powered speakers. Submitted by Vinh Mai (not verified) on Jun. 5, 2018. If i pick unpower mixer and power speaker and sub speaker, which kind of sub speaker should go with that set? Do i need amplyfier with power sub speaker? Thank you for all your help in past post . Submitted by Jason Horton on Jun. 5, 2018. If you go with an unpowered mixer then you need both powered subs and powered tops. Submitted by michael hollandwhat (not verified) on Aug. 27, 2018. Hello what power amp do I need to power my z10 thanks mick. Submitted by Jason Horton on Aug. 27, 2018. Hi Mick - I'm not sure what you mean by "z10", can you provide a link to an example?